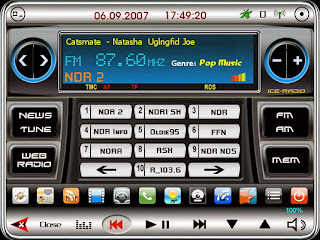 In my previous post I have listed some radio stations which can be played online using the embedded player. In this post I will explain how to embed an online internet radio player on a blog/website. Get the link to the station. This can be extracted from the website of the respective station or a playlist file which is used to play the station or by searching in google. Search for the link to station which you want to embed. Some sites/radio also provides playlist files such as .pls, .asx, .ram etc. Try to use these links directly, or download(use a download manager) these files and open using notepad to get the stream. Some sites/radio will not have these playlist files, but just the player embedded. In this case use the view source or inspect element option in browser to examine the web page source and find the stream link. Go to the html view of the blog/website and past the following code at the place where you want the player to appear. In the code where ever the string "http://keralaradio.in/media/KeralaRadio.asx" is present, should be replaced by the link to internet radio station which you want to stream. false to true and change in line no 10 autostart="1" to autostatrt="0"
And this will be the resullt of the above code. Click the play button to start playing/streaming the radio station. Hi, Thank you for your code , Its easy to do. And i am wondering how can I listed radios URL. really great, thanks for sharing. hi , thanks for the code, but im a little confused..
but i cant find any links with .asx at the end? where do i find radio sation links to put in the player? Hi, I followed this instruction and it seems to be working just fine on my site when I'm using firefox browser. but when I used Internet explorer browser, it wont play. I was just wondering if you got a tip to solve this problem. Thanks :) ! It was easy to follow and very clear ;) I just need to know, now, where or how to find the plugin it says is missing ;) Which plugin should I look for ? Check for widows media player plugin. Install it and it will start working. it works in a computer, but how can make it play like in an iphone, android? thanks for sharing radio embed..
Big Thanks for this code!really nice.i have spent my most of the time to spend with online tamil fm visit it.have a nice day go ahead.